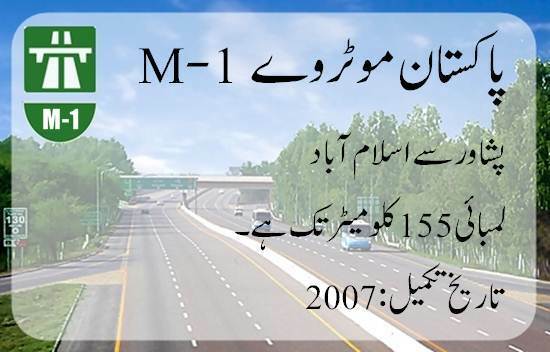 Motorways are a network of multiple lanes, high speed and controlled access roads in Pakistan. As on 01 April 2019, about 1428 km of motorways are operational while 2838 km of motorways are under construction. These motorways are part of Pakistan's "National Trade Corridor Project" which will link Karachi Port, Bin Qasim Port and Gwadar Port to the rest of the country and further with China, Afghanistan, and Central Asia. CPEC will link Gwadar Port with Kashgar (China) using these motorways. It is 6 lanes, 155 km motorway between KPK's provincial capital Peshawar and federal capital Islamabad. It is operational since 2007. M-2 is the first motorway in Pakistan which was completed in 1997. It is 6 lanes, 367 km motorway between federal capital Islamabad and Punjab's provincial capital Lahore. 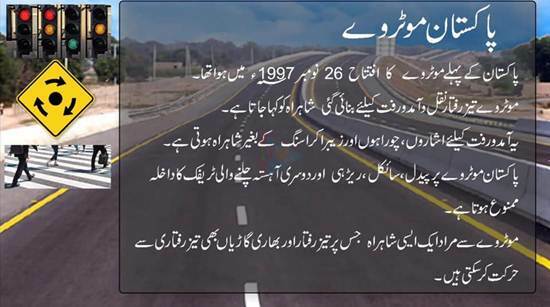 This motorway is 6 lanes, 230 km and it links Lahore and Abdulhakim. Construction began in 2015 and it is operational now. Construction began in 2009 and it is partially operational. It will be fully operational during this year. Its total length is 309 km. The total length of M-5 is about 387 km. Construction started in 2016 and it will also be completed in 2019. This motorway is planned but construction work has not yet started. It is an 892 km long motorway. It is under construction and also partially operational. Construction on this motorway was started in 2015 and it was completed in 2018. It links Hyderabad with Sindh's provincial capital Karachi. It was completed in 2007. It was started in 2017 and will be completed during this year. It will connect Lahore with Muridke, Narowal, Gujranwala, Sialkot, Daska, Wazirabad, Gujrat, Jalalpur Jattan and Kharian. It is a 4-lanes motorway which will be completed in 2019. Purpose of this post is informational and educational. We have put utmost care while gathering information however if you found any information missing or incorrect, please mention it in the comments section and we will update it accordingly.